HAVANA, May 3 2016 (IPS) - In the past, all rural homes in Cuba had gardens for putting fresh vegetables on the dinner table. The local term for these gardens is “conuco”, a word with indigenous roots that is still used in several Caribbean nations. The gardens provided the foundation for healthy meals based on vegetables and fruit grown without chemicals. The families also grew spices, as well as products that they did not sell at market, in order to have a more varied and tasty diet. But this tradition is fading in the Cuban countryside. However, farmers aware of the importance of the family garden, non-governmental organisations and researchers recommend that the tradition be revived, to boost food security among the rural population, which represents 26 percent of the country’s 11.2 million people. “Gardens aren’t that common anymore, at least in this area; that tradition has been lost,” said Abel Acosta, the biggest flower grower in the province of Mayabeque, next to Havana. “What is most common on the farms are the old orchards, thanks to our grandparents, who planted fruit trees, thinking of us,” he told IPS. Acosta is a 42-year-old agronomy technician who turned to farming for a living in 2008, when the government of Raúl Castro began to distribute idle land to people willing to farm it, as part of a broader policy aimed, so far with little success, at boosting agricultural production. Since 2009, 279,021 people have received land to farm. Like Acosta, many of them had to learn how to manage a farm, and commute every day from their homes in nearby towns to their land. “The new generations have a different concept; they plant with the idea of harvesting and seeing their profits grow quickly. They feed their families with whatever they are growing at that time to sell, and they buy everything else outside,” said Acosta, the head of the 2.5-hectare San Andrés Farm, which produced 100,000 dozens of flowers in 2015. “None of the 25 farmers who I deal with the most have a home garden,” said the farmer, who lives in the rural settlement of Consejo Popular Pablo Noriega in the municipality of Quivicán, 45 km south of the capital. “Producing food for consumption at home is a good idea because you don’t have to buy things elsewhere and you save time and money. Sometimes no one is even selling a single pepper in town,” said Acosta, referring to the unstable local food markets, where supplies are often low. That is why in San Andrés, which employs three farmhands, small-scale crops are grown for the five families involved in the farm. 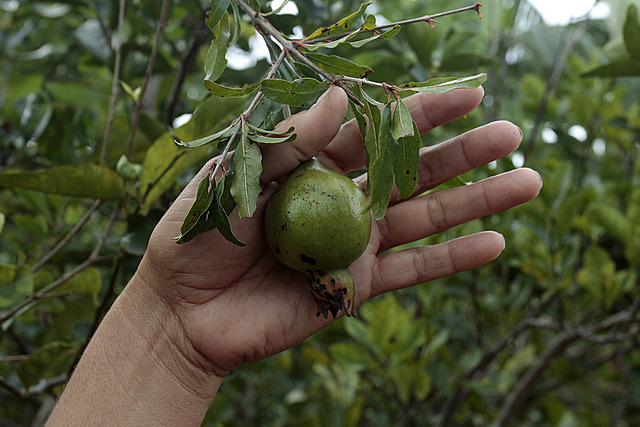 The farm inclues a half-hectare mixed orchard with coffee bushes and mango, avocado, lemon, tangerine, orange and “mamey sapote” trees. Besides, Acosta’s father retired from a job as a public employee and is planting plantains – cooking bananas – and growing foods like cassava, tomatoes and lettuce. 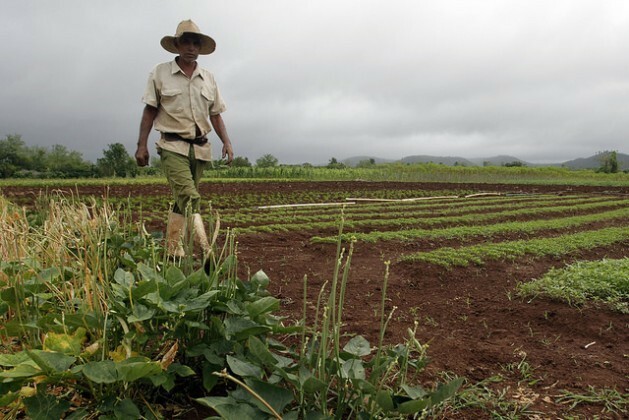 “In Cuba a large part of this (conuco) culture has unfortunately been lost as a result of the structure of agricultural production in rural areas,” lamented Theodor Friedrich, the representative of the United Nations Food and Agriculture Organisation (FAO) in Cuba. FAO promotes “family gardens, which formed part of the culture of rural families, not only in Cuba,” Friedrich told IPS. For decades, local scientific researchers have been studying conucos, among other traditional practices. Unlike in other countries, in Cuba conucos do not have indigenous roots, but were originally small plots that slaveowners let slaves use to plant or raise small livestock for their own consumption. 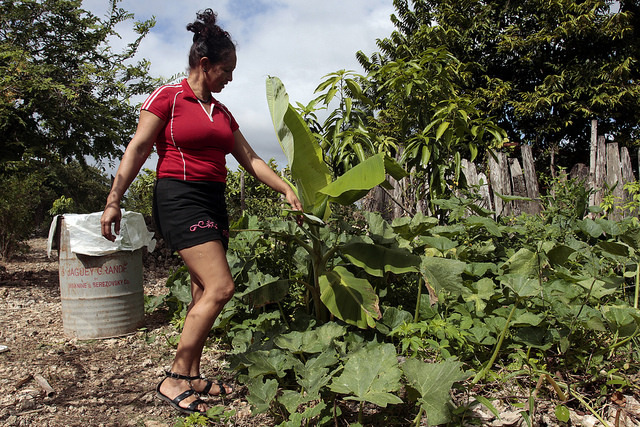 A 2012 report, “Twelve attributes of traditional small-scale Cuban rural farming”, described home gardens in the countryside as “a dynamic, sustainable agricultural ecosystem that contributes to family subsistence.” It also considered the gardens key to preserving local species and varieties. The study by the governmental Alexander Humboldt National Institute of Basic Research in Tropical Agriculture was partly based on field research in family gardens in 18 localities in west, central and east Cuba. Home gardens, which vary in size, are used to produce food for the family, fodder for livestock, spices and herbs, biofuel and ornamental plants. They even generate income, because the families sell between five and 30 percent of what they produce in the gardens, the study said. The gardens studied maintained the traditional practices of intercropping and crop rotation, and generally used organic fertiliser. “Farmers have always had conucos for family consumption, although they don’t cover 100 percent of needs,” Emilio García, a veteran farmer who owns an 18-hectare farm on the outskirts of Camagüey, a city 534 km east of Havana, told IPS. Although less than five percent of the population was undernourished in Cuba between 2014 and 2016, according to FAO, the country depends on food imports that cost millions of dollars a year. And although the government provides a basic basket of heavily subsidised foods and other items, it does not completely cover people’s needs, and other foods are very costly for Cuban families. IPS spoke to other people who improve their family diets with vegetables grown in their conucos, such as 39–year-old homemaker Aliuska Labrada, who lives in Ciénaga de Zapata in the west of the country, and 61-year-old José Leiva, a farmer who owns 4.5 hectares of land in Horno de Guisa in eastern Cuba. Leiva is receiving training and support from the non-governmental ecumenical Bartolomé G. Lavastida Christian Centre for Service and Training (CCSC) based in Santiago de Cuba, 847 km from Havana, which carries out development projects in the five eastern provinces and the central province of Camagüey. The CCSC is involved in 45 ecological farming initiatives in 20 municipalities, which had benefited 1,995 families by late 2015, with the help of Bread for the World of Germany, Diakonia-Swedish Ecumenical Action and the White Rose Ministry of the First Presbyterian Church of Brooklyn, New York. The Programme for Local Agrarian Innovation (PIAL), active in 45 of the country’s 168 municipalities, promotes home gardens to empower rural women, with support from the National Institute for Agricultural Sciences and the Swiss Agency for Development and Cooperation since 2000. As of late 2015, 6,240,263 hectares of land were being farmed in this island nation of 109,884 square kilometres, 30.5 percent of which was farmed by the state, 34.3 percent by cooperatives and the rest by small independent farmers.